Lotus & Leaf has over 15 years of experience in creating and managing reunions, workshops & galas for not-for-profit groups, alumni associations and private clients. We specialize in strategies that reach fund-raising goals, raise public awareness and maximize brand presence. The fund-raiser at 62 on Hudson , NYC. 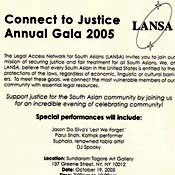 LANSA Fundraiser, Tagore Gallery, New York, NY. Legal Access Network for South Asians is a lawyers' group that provides resources and legal aid to those in need. 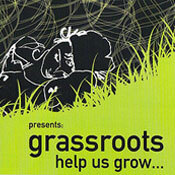 Grassroots Reception, Tagore Gallery, NYC. Acclaimed Paris-based conceptual & trans-active performance artist's introduction to New York. Fashion Show and Dinner Cruises around Manhattan with internationally acclaimed designers. 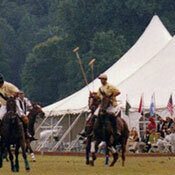 The AFPSRD Independence Polo Cup, Tinicum Park, Bucks County, PA.
A fundraiser polo match with 2 East Coast polo teams, followed by a post- match supper elegantly served in tents. 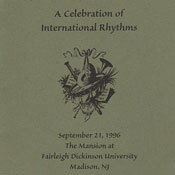 A commemorative program brochure was designed with information of the game's history, its rules. 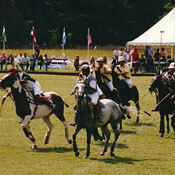 PR included a feature article with professionally-shot photos in a US society magazine. A special information package was provided to NYC sponsors and their guests with featured area antique shops, boutiques and restaurants. A black-tie gala with international music performances at Lenfell Hall, a 19th century mansion in New Jersey with formal gardens by Frederick Law Olmsted. Entertainment: Moroccan Gnawa musicians, South Asian dhol player, Caribbean steel drums, Chinese Lion Dance troupe and Andean musicians. A celebration of 17 th century Mughal Lahore. Gala reception & buffet dinner with a Khathak dance performance.